Russian President Dmitry Medvedev is in Kiev on his first official two-day visit, which is being seen as a sign of improving relations between Russia and Ukraine. Among other issues, the two sides discussed cooperation in energy and nuclear sectors. On Monday the Russian president along with his Ukrainian counterpart Victor Yanukovich have visited the Park of Glory to lay flowers at the Tomb of the Unknown Soldier. The leaders of the two states have also honored the memory of those who perished in the famine of the 1930s at the Holodomor memorial. During the bilateral talks, the two presidents discussed issues concerning European security, security in the Black Sea region and the Transnistria settlement. President Medvedev has praised Viktor Yanukovich for being a good partner to work with. “But it doesn’t mean that there will be no points of contention, that there will be no misunderstandings as well. On the other hand, it is more or less clear that these two political leaders are able to overcome difficulties, to overcome eventual contradictions,” Dmitriev added. 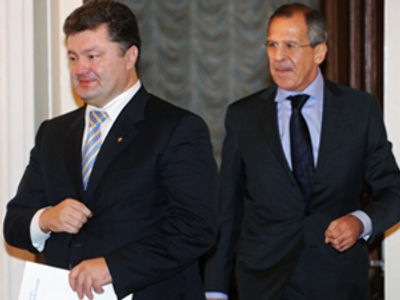 An agreement on the demarcation of the Russian-Ukrainian border was signed by the foreign ministers of both countries. Several agreements have also been signed in the fields of collaboration on the GLONASS navigation system, culture, tourism, and inter-bank cooperation. On Tuesday, the second day of Medvedev’s visit, a business forum is to be held in Kiev, where entrepreneurs will also discuss joint work in the business sphere between the two countries. The head of Russian president’s administration Sergey Naryshkin pointed out that the visit will help further develop “unprecedented intense and fruitful political dialogue” between the countries. He reminded that it is already the seventh meeting of the leaders since Victor Yanukovich came to power in February 2010. The main focus of negotiations was on the development of economic cooperation as Ukraine is one of Russia’s main economic partners. In January–March trade turnover between the countries increased twofold. Naryshkin pointed that the sides’ investment cooperation has a significant potential. Currently there are over 2,000 enterprises with Russian capital in Ukraine. Russia also occupies fourth place concerning the amount of foreign investments in the country.